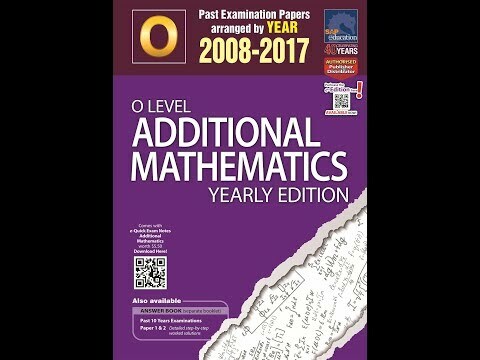 I am selecting unique questions from 2017 GCE O-Level Additional Mathematics to discuss in my upcoming videos. This first one is on linear law. In this video, I share with you a strategy I teach my student to make linear law easier to understand and reduce careless mistakes to a minimum. I called it "Capital Letter". I use capital letters to represent the complicated horizontal and vertical axes. Even my equation of line is in capital letters too. Look at my video to understand my thinking process and apply it to yours when it's your turn to solve a linear law question. This question is interesting as we do not have to draw the graph which is commonly asked in the past. This question will cause your downfall if you are not absolutely clear on the concepts of linear law. Get my copy of Ten Year Series in all Popular bookstores! Many students upon reading this question might not realise that it is testing our understanding of the concept on Highest Common Factor learnt in Secondary 1 Mathematics. A floor 6.8m width and 11.05m length is to be paved with equal square tiles. Find the number of largest dimension square tiles that exactly fit the floor? Step 1: I converted the metres into centimetres by multiplying with 100 (1m = 100cm) so that I can work with whole numbers instead of decimals. Step 2: I express each dimension in index notation by prime factorisation method. Question of similar nature was asked in the recent year GCE O-Level examination in Paper 1 and many students did not know how to approach the question. I hope you find the explanation clear. It is always recommended to sketch a simple diagram to get your thinking started.